Traditional Chinese Medicine (TCM) maintains that the body’s Qi (vital energy) flows around the body through 12 regular channels, which link the different organs, and each other. The channels form a network, or matrix of channels all over the body. There are also eight extraordinary meridians, which interconnect and again connect back to the twelve regular channels. They can be seen as a reservoir for energy from the twelve regular channels. In ill health, including addictions, the body’s Qi is unbalanced, the flow may be ‘irregular’, ‘unsmooth’ and therefore the person experiences various symptoms of body and/or mind. A very simple description of acupuncture points can be seen as places where the Qi can be influenced; therefore this is why they are needled. The needling helps to influence and correct the disordered Qi along the channel, and regulate the disordered Qi of the organs. In any long term addiction, the body’s Qi is said to be profoundly affected. Since TCM understands that imbalance in one channel or organs will over time have an effect on other organs and channels, points on other channels are usually also chosen to reflect the patient’s symptoms and general emotional patterns. TCM acupuncture clinic sessions may involve body and ear acupuncture needling simultaneously, as neither is contraindicated. Within TCM, the ear would be as theoretically valid as only other place to needle, although it has to be said that lower legs and arms and the back are perhaps most commonly used along with points at or near the affected body part. Interestingly, in modern times, many ear acupuncturist colleagues specialize only in working on the ear, feeling its effects are adequately powerful for their purposes. Acupuncture generally involves a health consultation before points are chosen according to the TCM diagnosis. The acupuncturist leaves the room to allow the patient to roll up trouser legs or remove a shirt. Towels are usually left on the couch to avoid them feeling cold or embarrassed by feeling ‘over-exposed’. The practitioner then makes sure the patient is comfortable and inserts the needles. 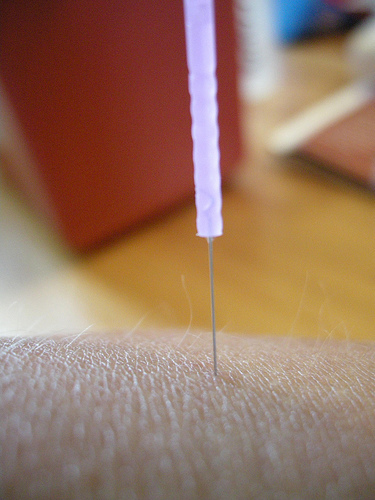 In the West, generally speaking practitioners use sterile disposable fine needles, manufactured specifically for acupuncture. (In Europe these must carry a CE mark on the packaging to show quality control.) The needles are inserted carefully, and then they stay in place for usually around 20 to 30 minutes. Most practitioners leave the patient to relax alone, checking on them periodically. At the end of the treatment, the practitioner removes the needles for disposal into a sharps bin. A usual course of acupuncture is 6 to 10 sessions, although this will vary from patient to patient and practitioner to practitioner. DISCLAIMER: NO information here is intended to be taken as medical advice – or used as a substitute for professional medical advice. Any person with any health concerns is advised instead to consult their doctor. In the case of persons seeking therapy using Traditional Chinese Medicine, this information cannot be taken as medical advice and persons are advised instead to consult a suitably qualified professional practitioner. Also please note acupuncturists’ working styles do vary between practitioners, so this general overview can’t be used any kind of ‘benchmark’ for judging their standards! Many thanks for your understanding.